David Sedaris might have a sinus infection or a tooth ache and possibly needs a root canal. Pre-cancer is a contender as well. But none-the-less, the hysterically funny satirist takes the stage at NAU’s Ardrey Auditorium on November 4 and is welcomed by an adoring audience. With a number of New York Times bestsellers under his belt and popular contributions to NPR and BBC radio, David Sedaris’ dedicated following fills seats. 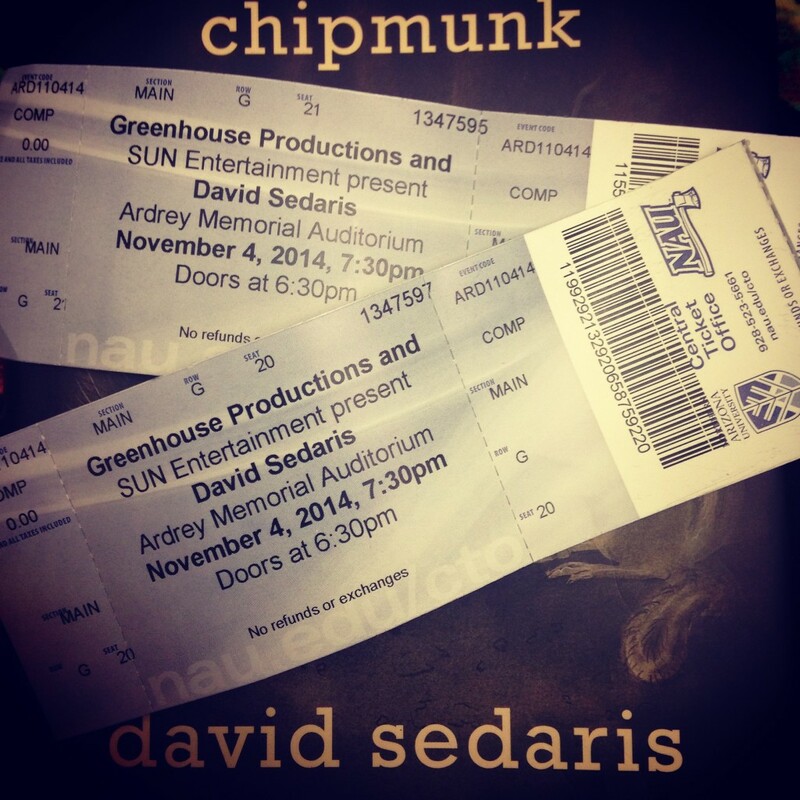 With my hardcover of Squirrel Seeks Chipmunk in hand, I eagerly take my own seat in the crowd, settling in among friends and fellow fans of the humorist. After cheers quiet, Sedaris opens his notepad and shares that he needs amoxicillin or any other kind of antibiotics because he has been informed that he might have a sinus infection. He is astonished that sinus infections exist and that he has contracted the ailment. He insists that anyone who has these items or the ability to write a prescription should be the first ones in line to get their books signed. The comedic author begins his routine with a tale of visiting Sweden. Sedaris explains that he dreamed of visiting the country in the same way that most Americans dream of visiting Paris, picturing his time there as a collection of landscapes acquired from movies and calendars. He is so determined to enjoy the trip that he makes use of a Swedish phrase audiobook and adds thirty Swedish words to his vocabulary in preparation. He discusses the Swedish gender-neutral pronoun hen, and the consistently growing acronym formally known as LGBT. Sedaris continues with equally hilarious stories of spending Christmas with his sisters at his home in West Sussex, England. Sharing with the audience how they are getting older and though that means slowing down, it also means he has the privilege of offering visitors a choice of two guest bedrooms in his home. Funny quips from diary entries are read and the evening ends as David Sedaris opens the floor to questions from the audience. Rachel Stevens, Bookmans alumni and Keep Flag Happy columnist, is the first to raise her hand. When addressed, she asks David if he has tried a cold compress for his sinus infection. Another audience member suggests that he may not have a sinus infection at all but rather a tooth ache. This of course leads to further panic. Though the acclaimed author feels under the weather, he manages to stay an extra two hours for book signing. The lobby is flooded at Ardrey Auditorium as fans wait in line to meet the author. 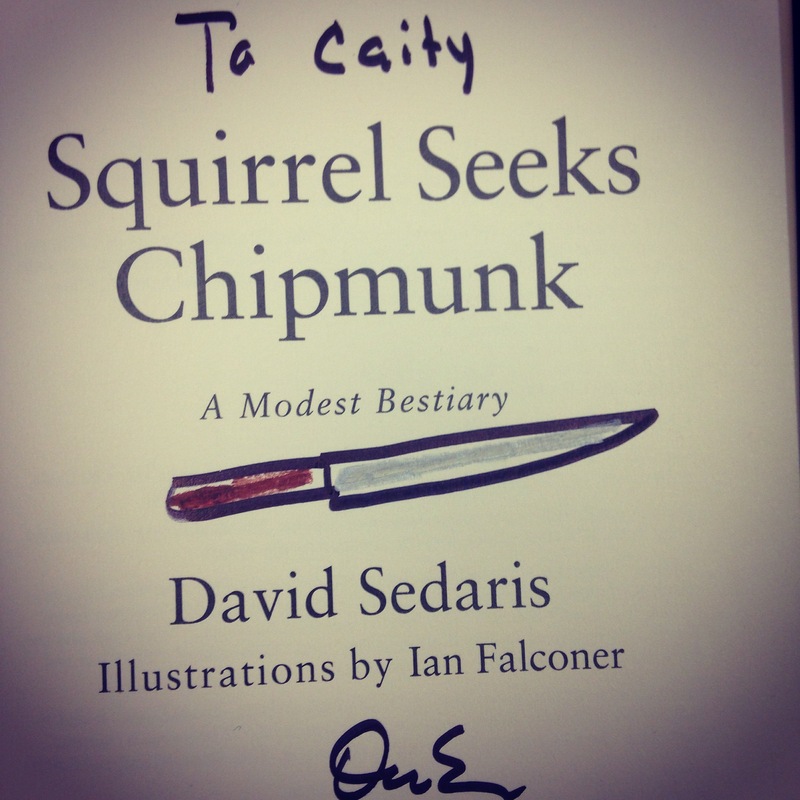 When it is my turn, I enthusiastically hand over my copy of Squirrel Seeks Chipmunk and watch Sedaris draw a lovely little dagger on the cover page to accompany his signature. He asks if I had any advice for curing a sinus infection. I reply, “No, but maybe a doctor visit is in order.” Sedaris is obviously a hilariously talented and accomplished writer but what I take away from this experience is how incredibly kind and dedicated he is to his fans. It would have been easy to cancel the whole evening, much less the book signing. He sticks it out and continues the astounding tour of 47 cities in 49 days. Thank you, David Sedaris. Now please someone give the poor man some antibiotics! Thanks also to the people at Greenhouse Productions for bringing Sedaris to Flagstaff. For more information about events like this. Please visit Greenhouse Productions and check out their calendar for shows and artists coming to Flagstaff. Browse the humor section at your local Bookmans for more by the hysterically funny author, David Sedaris. starting it generally in the United states and You.K. previously this month. Skype for Website also now facilitates Linux and Chromebook for immediate messaging communication (no video and voice but, all those require a plug-in installing).